Human tumors often include slowly proliferating cancer cells that resist treatment. 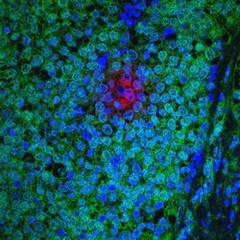 This image shows a cluster of slow-cycling (AKT-low/Hes1-high) breast cancer cells (red) within a human ER+ primary breast tumor (cell nuclei in blue; rapidly cycling, AKT-high, cancer cells in green). Cancer cells enter an AKT-low state in response to decreased interaction of cell surface beta-1 integrin with the extracellular matrix. AKT-low cancer cells within invasive breast cancer tumors persist after combination chemotherapy and contribute to tumor progression.